Warner Bros. has launched a new cause marketing partnership with Habitat for Humanity called “There’s No Place Like Home,” a campaign celebrating the 75th anniversary of the classic film, “The Wizard of Oz™.” The yearlong program features a digital fundraising campaign where consumers are rewarded for donations to Habitat with a variety of products provided by Warner Bros. licensing partners. The campaign will also feature local Habitat for Humanity build events around the country. Additionally, select venues featuring Andrew Lloyd Webber’s “The Wizard of Oz” musical, will facilitate donations each time a patron checks into the local theater on Facebook. Using cause marketing to promote new or re-released films is becoming more commonplace but “There’s No Place Like Home” takes these efforts to an entirely new level. Our friends involved with the campaign share that the Warner Bros./Habitat partnership started with employee volunteering. 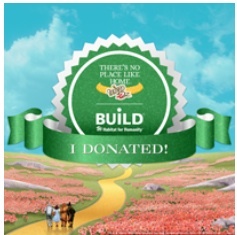 The door to the yellow brick road was opened when the Warner Bros. Consumer Products team came up with the idea to create a more robust initiative using the affinity for the WOZ brand to benefit longtime studio partner Habitat for Humanity. Armed with a promotional toolkit, licensees also cross-promote the campaign via their social channels in addition to providing product as donation incentives. We’re eager to follow the trajectory of this robust, collaborative effort. Sounds like a great campaign with a perfect thematic fit. Any idea if theater screenings of the film will have "pre-roll" spots for Habitat? If the film is on a streaming platform like Netflix, can they run pre-roll there as well?